Mark Woodson couldn’t stop the tears. 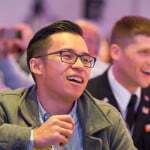 Continually dabbing at his eyes, he watched each of his four children take the ASCE 2015 Convention stage Tuesday to introduce their father with words of love and support for him during his installation ceremony as ASCE’s 2016 President. “I’m blessed to have such an amazing father who has inspired me every step of the way,” said John Woodson, P.E., M.ASCE, Mark’s son and a third-generation civil engineer. Certainly the Society members at the ceremony, part of the Annual Business Meeting, left knowing how essential family is to their new president. In addition to his children, Woodson’s mother Ruth, wife Lupe, and eight grandchildren were in attendance to celebrate the start of his presidential year. The installation of 2016 officers also included Norma Jean Mattei, Ph.D., P.E., M.COPRI, F.SEI, F.ASCE, as the new President-elect. 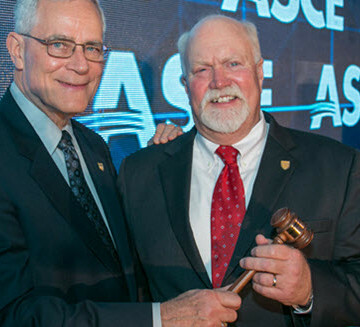 The ceremony marked Bob Stevens’ final act as ASCE president. He passed the presidential pin and gavel to Woodson and now transitions to his role as 2016 past-president. Executive Director Tom Smith opened the business meeting to an ovation upon announcing that ASCE now boasts more than 150,000 members. ASCE continues to expand its global reach, Smith reported in his State of the Society address, with members in 177 countries and the recently established Global Strategy Council. That diversity has been seen at the Convention itself, with attendees present from 34 countries. Smith noted the past year’s many high-profile efforts spotlighting the need to upgrade the nation’s infrastructure, with nine new state Report Cards released, the Infrastructure #GameChangers report highlighting some of the most innovative solutions to challenges around the country, and the ongoing push to urge Congress to enact a long-term funding solution for the Highway Trust Fund. 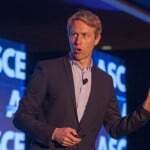 The Industry Leaders Council’s Grand Challenge to drastically reduce infrastructure life-cycle costs over the next 10 years ensures that it will be among ASCE’s key goals for years to come, Smith noted. “The rally is to foster the optimization of infrastructure investments for society to help close the gap in our infrastructure needs,” he said. 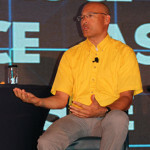 Mark – Congratulations on assuming the role of president of ASCE. I believe you and I worked together briefly at Cella Barr in Tucson in the early 1980’s. Happy to see you have your own firm and have done so well! I’ve been working for CDM Smith in Cincinnati since shortly after leaving CBA in 1986. I like Ohio, but still miss beautiful Arizona!